CASPER, Wyo. – The cowboy way is alive and well in Alva, Okla., and the Northwestern Oklahoma State University rodeo team proved it last week at the College National Finals Rodeo. Five Rangers qualified for the championship round in Casper, and the men walked away as the No. 3 team in the National Intercollegiate Rodeo Association, thanks to the fantastic showing of steer wrestler Cody Devers, heeler Tanner Nall and all-around cowboy Maverick Harper, who made the final performance in tie-down roping and team roping. 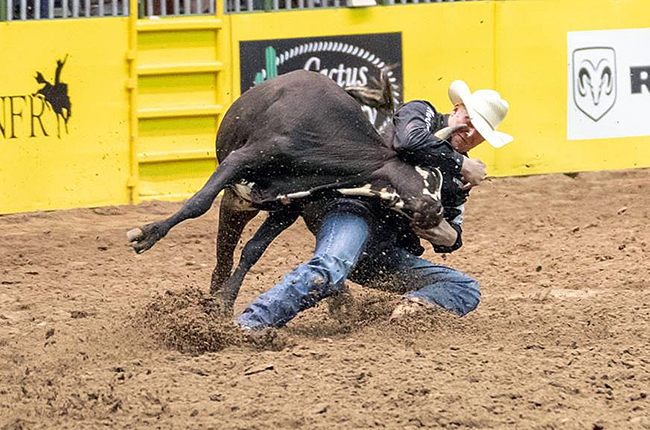 While Harper secured points in both events in which he competed, Devers stood out in steer wrestling. He finished the seven-day rodeo as the reserve college champion, knocking down four steers in a cumulative time of 18.5 seconds. He also won the first round with a 3.8-second run and was fourth in the championship round with a 4.6. “I made as good of runs as I could with the cattle I had and was fortunate to win a round,” said Devers of Perryton, Texas. “I just wanted to be the best on every steer that I could and see what happens. Yes, it was, and so was the team title. Not only did Devers, Nall and Harper score valuable points for the Rangers, but they also got some big help from freshman steer wrestler Bridger Anderson of Carrington, N.D., who won the second round with a 3.5-second run. The Texan rode Woody, a buckskin horse owned by teammate Talon Roseland of Marshalltown, Iowa. That served to be quite a benefit to Devers. Having a good horse is important in any rodeo event. Harper and Nall have confidence in their mounts. Harper placed in the first round of tie-down roping, while he and Nall placed in both the first and short rounds in team roping. “I treated it like another rodeo,” said Harper of Stephenville, Texas. “I wanted to be aggressive, doing what I knew I could do. The Northwestern women had two cowgirls qualify for the championship round: breakaway roper Brandi Hollenbeck of Hutchinson, Kan., and goat-tier Jenny Massing of Ponoka, Alberta. Hollenbeck finished 13th in the nation in her discipline, while Massing was ninth. Barrel racer Sara Bynum of Beggs, Okla., won the third round with a 14.12-second run, while Taylor Munsell of Arnett, Okla., posted a 1.8-second breakaway roping run to finish second in the third go-round. All said, it was a strong showing from all Northwestern athletes, something that bodes well for the program and coach Stockton Graves. It worked last week in Casper.